Eagle Woman shared her wisdom this morning after taking part in a healing ceremony outside the Bataclan theatre, led by Indigenous Peoples who are in Paris for the climate summit. She is resisting fracking in her community in North Dakota and is part of the Indigenous Environmental Network delegation to #COP21. The Indigenous Environmental Network (IEN), a grassroots consortium of indigenous leaders and communities working for environmental justice and the rights of Mother Earth, have helped organize a delegation of 35 indigenous people who will travel to Paris to make their concerns and issues regarding climate change and the environment known to world leaders and the public. Follow their progress at Indigenous Red Road to Paris & Beyond. 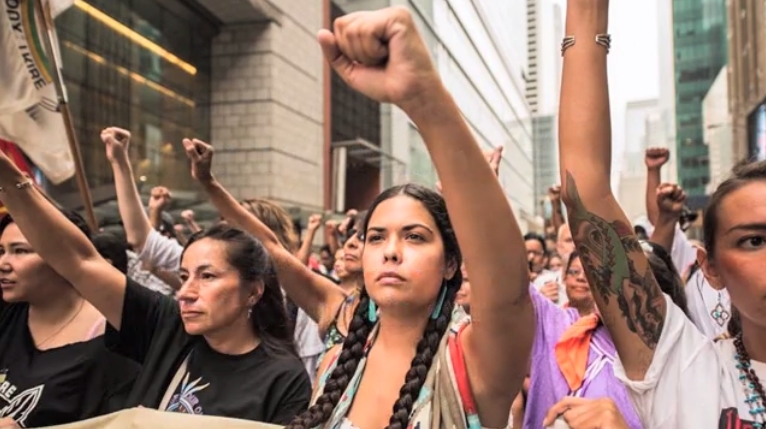 Responses to " 35 indigenous Climate Warriors Descend on Paris for COP21"
I thank you for living your truth ! the generations.... That of those who have gone out before you... I beg of you in this second and this moment not to be the generation that has not carried out THE INSTRUCTIONS to restore humanity to its more purer form. It is your time at this moment to make a change... brothers and sisters listen to what I am saying to you, it is of the TRUTH... gather male and female and find the grandmothers voice within your soul and Sing her song.. the song of creation... The Song of the Living waters.. Seek All Truth NOW! I plead the case of All generations to restore balance to not only this earth, but to this plane of humanity, so they will travel on into the next generations wearing wisdom within their souls. The next generations knowing All things and understanding the Knowledge Whom stands before them. Seeking within leads you to and Understanding of All things, because you are All Things, you are All related my brothers and sisters. Seek out the Truth within yourselves to finally become of All Ages and All Living Things. Sing the Song of the Grandmothers heart for All her children of the Earth and All Life joined within.. Ride with the Spirit of the Wind in Love and Peace..